It will be her fourth term. 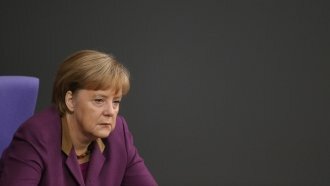 Merkel will serve another term as German chancellor. Merkel's Christian Democratic Union of Germany and its sister party received the most votes in Sunday's federal elections. That means they'll remain the largest party in Germany's Parliament. Perhaps more notable here is the success of the far-right party Alternative for Germany, or AfD. Receiving over 5 percent of the votes means it's the first far-right party to have members reach Germany's Parliament since the National Socialist German Workers' Party, also known as the Nazi Party, fell at the end of World War II. This is also the first national vote since Germany, under Merkel's leadership, opened the country's doors to almost 900,000 migrants and refugees. The upcoming term is expected to be a busy one for Merkel. Germany will play a major role in facilitating the U.K.'s exit from the European Union. The chancellor will also be tasked with combating terrorism, climate change and an increasingly threatening North Korea.